Anyone who has ever watched or read about Thomas the Tank Engine will know how engines can cause “confusion and delay”. Well, there was plenty of that on the road to Thornton Rust between June 25th and 28th. Even the Little White Bus service to Thornton Rust was suspended after the road from Aysgarth was suddenly closed. Part of the problem arose from the lack of communication between North Yorkshire County Council’s Street Works team and its Highways Richmondshire Area Office. 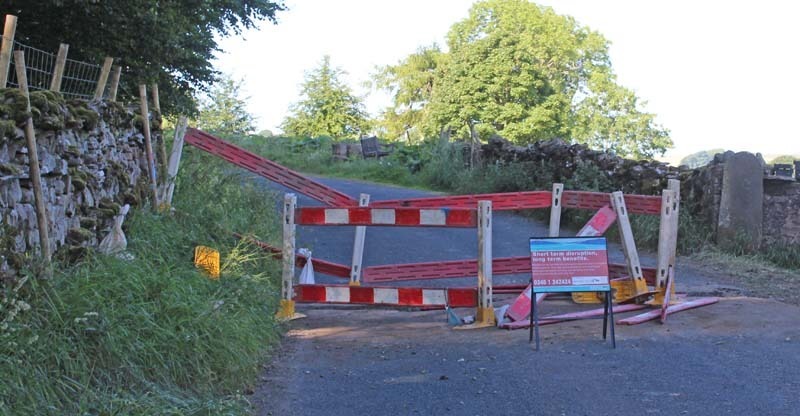 A resident, Gill Harrison, informed North Yorkshire County Council’s (NYCC) Highways Richmondshire Area Office on Tuesday June 26th that the road closure was causing mayhem. “Morrisons Utilities had dug a trench across the width of the road and placed an inappropriate and badly signposted diversion, “ she said. She reported this had caused problems with the school bus service and for those trying to get to work, with the delivery of animal feed, and that a milk tanker was forced to reverse 500 yards back towards Aysgarth on Monday afternoon because there wasn’t a road closure sign at the junction with the A684. Neither the villagers nor Aysgarth and District Parish Council received any warning that Morrisons Utilities, on behalf of Yorkshire Water, would dig a trench across the road just outside Aysgarth on Monday. For the villagers, however, it was worse because there was no “road closed” sign at the east end heading towards Aysgarth. This meant that some had almost reached Aysgarth before they found the road was blocked. “From what I have seen of the work, a couple of metal plates across the narrow trench would have provided access during non-working times,” Thornton Rust parish councillor David Pointon said. When North Yorkshire County Councillor John Blackie reported the issue he was informed that Yorkshire Water did have a permit from the NYCC Street Works team to repair a burst water main with the work to be carried out from Monday June 25 to Wednesday June 27. The road was not re-opened until the afternoon of Thursday June 28. Cllr Blackie was told that a notice about the road closure had been posted on the county council’s inter-active website. He commented: “The NYCC inter-active website does not replace the need for NYCC Area Highway Offices to inform the local County Councillor and the Parish Clerk in advance of a road closure, especially those implemented in an emergency situation, [as] communications with local communities remain very important so local people can make adjustments to their travelling plans. Nor does it replace the need for properly signed diversion routes. He described the situation as a fiasco and feared similar situations could arise in the future. Which happened sooner than he expected as he reported on July 1 – this time in Hawes.